The best animated films by young artists from Central and Eastern Europe. VAF NEW TALENTS project is intended for alternative promotion of the most talented young animation filmmakers from Central and Eastern Europe. Its aim is to present internationally the 9 best films made by young and debuting artists in a given year to a professional audience and for the general public. The selection of the films focuses on extraordinary talents whose work promises successful future careers. The project counts on the presentation of this compilation at selected films festivals and to draw attention to new talents and bring them together with experienced foreign producers. In 2017, VAF New Talents is also adding additional activities including cinema distribution in selected countries. The quality of animation from the region of Central and Eastern Europe (CEE) increases year by year; due to lack of sufficient space for animated film promotion through national film institutes, alternative ways of presentation are needed. With this in mind, the VAF has taken the initiative and, as the first such project in the region of Croatia, the Czech Republic, Hungary, Poland, Slovakia and Slovenia, we are trying to make our animation visible even beyond the borders of the countries of origin. The selection of films for VAF New Talents focuses on those whose creativity signifies promising careers in the future and are already above the average. How do we make a selection? Each year, a board of experts from CEE is compiled to select the best work produced in the region that year. Festival artistic directors Annaida Orosz (Primanima), Olga Bobrowska (Stoptrik), Pavel Horáček (Anifi Maroš Brojo (Fest Anča), Daniel Suljic (Animafest Zagreb) and Igor Prassel (Animateka) participated in the selection. VAF NEW TALENTS involves launching a booklet with detailed information about films their creators and contacts for the producers or schools of origin. Its aim is not sales but rather support for dissemination at film markets, among film distributors, sales agents and festival program directors. The film selection will also be screened at various film festivals and in cinemas around the world so as to reach mainstream audiences. Visegrad Animation Forum will also closely cooperate on the project with national film centers and domestic professionals from the region. Our primary ambition is year-round promotion of awareness of animation by young artists from CEE and assistance for its further development, visibility and distribution. 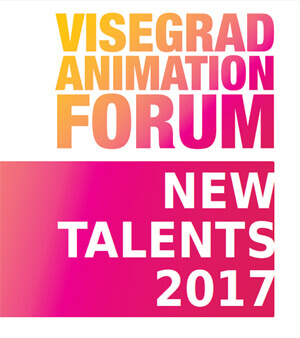 The Visegrad Animation Forum is mainly a “market access platform“. It tries to bring together partners, producers, broadcasters, and film distributors not only from CEE. It also tries to find ways of financing animated short films, series and TV specials. The VAF is also an educational platform whose goal is to support young professionals while helping them to develop their real animation projects with experienced international professionals, or to create an international network for them. Within the framework of the VAF Trebon, we propose a support program of workshops for selected projects and their authors and producers. These workshops focus on good story assets, consultation of a realistic development plan and structuring a good pitch. The pitching competition is open for proposals of animated projects in development in two categories: Short film project (single film less than 20 min.) and Series + TV Specials (series of any format and single films over 20 min.). Another activity VAF Red Bricks aims to build up a CEE production network that based on mutual cooperation makes it easier for individual projects to reach as many national television broadcasters as possible and thus muster greater production potential. At the same time we want to prepare models and recommendations that would make it easier for television broadcasters to cooperate on international project with longer dates of delivery. Born 1991. Animation student and cartoonist from Cracow, Poland. In 2010 graduated from the National School of Fine Arts in Cracow. Currently fifth year student of Film Animation and Special Effects Department at the Polish National Film School in Lodz. Director, designer and teacher. Bella completed her MA degree as an animation artist at the Hungarian MOME University. She also took part in various different workshops (ASF, Transform@Lab), and spent one semester at the ASFA University in Athens. Since 2010 she has been lecturing at the animation department of MOME, and has completed 3 years research into ‘online content development’ for her DLA degree. In 2015 she founded the Cub Animation Studio. The movie is a black and white, rhythmic metamorphosis of abstract geometric forms. Its dramaturgy is developed from pure form and evocative music. It has been fully implemented cameraless, directly onto 35 mm film tape. Born in 1988, Gdańsk, Poland. Graduated from the Secondary Arts School in Gdynia, department: Artistic Photography. Studied Animation Film and Special Effects at Film School in Łódź from 2009 until graduation 2015. Graduated in animation at the Academy of Performing Arts in Bratislava. She showed her bachelor film Essence at the Festival SICAF 2015 in Seoul, South Korea. Occupation (her next film), which was entered at Fest Anča 2016 (Slovakia) is about abuse. Chilli, her master’s film, delves into temperament and aggression in a relationship. Martina teaches art to children. Animation film director and illustrator, born in Zagreb, 1990. Studied at the Academies of Fine Arts in Zagreb, Krakow, Prague and Tallinn. After completing her Animation MA in Estonia as a student of Priit and Olga Pärn, her first professional experience was as animator at the Joonisfilm studio. As well as directing animated films, she works as a freelance illustrator for children’s books and international political magazines. A young, naive female tiger lives there in harmony with herself and nature. When her awakening femininity is noticed by an older male tiger, the young tigress is getting increasingly scared by his heated approach. But escape is impossible on this secluded island. An independent animation filmmaker and illustrator, born in Budapest, 1990. From 2010 – 2016 she attended MOME (Moholy-Nagy University of Art and Design Budapest), animation department. In 2012, Anna spent an Erasmus semester in Ghent, Belgium. She is currently attending Animation Sans Frontiéres (ASF), the European animation production workshop. Her graduation fi premiere was at the Berlinale Generation section. A foreign body lives its own life. You can’t get rid of it. It‘s always with you, you need it. Caress that odd part of yours, don‘t try to shave its long tousled fur. This is a story about something considered strange at first, but which turns out to be the dearest thing to us. About the transformation of inside and outside. Lives and studies in Łódź. Animator, director, illustrator. Graduated from the Faculty of Graphics and Painting at the Academy of Fine Arts in Łódź, with a diploma in editorial design and illustration. She participated in student exchange programs with Universidade de Belas-Artes in Lisbon and Animationinstitut Filmakademie Baden-Wurttemberg in Ludwigsburg. Vojtěch studied illustration and animation at Umprum. He graduated with the multiple award winning pilot episode of the animated series Kuchyňské pohádky (Kitchen Tales). Since 2013 he has cooperated with Jiří Barta running the Studio of Animated and Interactive Art at the University of West Bohemia in Pilsen. He works as an animator, illustrator and graphic designer. Lovro is reminded of the day he first went fishing with his grandpa. His thoughts return to the fish pond, and the bathroom sounds and objects bring back memories of that day: putting a worm on a hook, getting tangled in his grandpa’s line, driving to the pond in an old car, catching a fish for the first time and seeing it die. – Društvo Slovenskega Animiranega Filma - :D'SAF! Presenting and pitching of developmental animated projects (short films and series / TV specials). Promotion of promising talented young CEE animation artists. Think-tank revamping CEE’s animation industry. Producers‘ network to enable and strengthen regional cooperation.